After a couple days of suffering I managed to get some scotch into my system. If you are in the Magic Kingdom yourself–you’re screwed. The only hope you have is being in Epcot and that can prove difficult. I was crestfallen and with that soul crushing defeat I moved on to more rides and food. The only saving grace that day was a Tequila tasting I signed up for. In the primary Mexico villa building lies a bar with an impressive selection of Tequila and mescals. I spent my days in lines waiting for rides; however, that was not time wasted as I searched the internet for a good liquor store in Orlando. This is a whole lot harder than you would believe it to be. Liquor stores are everywhere; yet, few actually keep a good selection of scotch. I have been to Disney many times over the years; however, I have never seen so many human beings on rascals. Rascal (for those of you who don’t know) are those little motored vehicles designed to help obese angry people drive about. They move at a clip seeming faster than the average walker and this allows American’s to show other countries that our people actually are becoming the characters from the movie Wall-e. This thought actually scares me at night. I felt embarrassed that every foreigner probably believes this is what the average American is like. 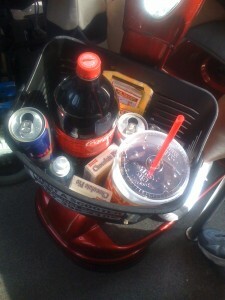 That most of us Yanks drive around in a fat cart with a basked loaded with Coke and Snickers bars. I promise you, some of us just drink scotch and don’t drive rascals—honest. Yes, the picture attached is taken at Disney of the Actual contents of the a fore mentioned basket. of the second e-book, or the second season of the show).